A flower is in fact a modified shoot. The flower's purpose is to reproduce that plant species sexually. Sepals are collectively, sepals are known as the calyx and make up the outer whorl of the flower. The sepals are usually green. In most cases, their function is to protect the unopened flower bud. They may be shed when the flower opens, or otherwise curl up backwards. Petals are usually the showy part of the flower, and are collectively known as the corolla. The calyx and corolla together are known as the perianth. The petals mainly function to promote pollination by attracting insects and other small animals to the flower. Stamens are the male part of the flower, and are collectively known as the androecium. A stamen consists of a stalk, called a filament, which carries an anther at its tip. The anther holds pollen. One of the two cells which make up a pollen grain eventually divides to form sperm cells. The centre of the flower is the female part called the gynoecium; and it is made up of one or more carpels. The term pistil is used ambiguously to describe either a single carpel or a group of fused carpels. A single carpel is made up of a stigma, style and ovary. The stigma, with its sticky surface, functions to collect pollen. 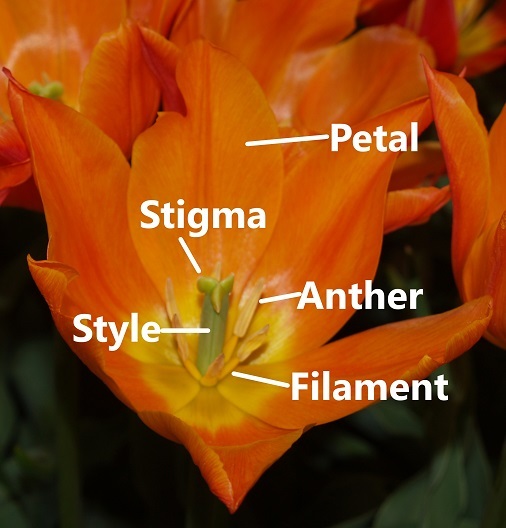 The style raises the stigma to promote pollen collection and connects stigma and ovary. The ovary contains one or more ovules, i.e. undeveloped seeds, in which the eggs are situated. These flower parts are inserted onto the flower base, or receptacle, which is located at the tip of the flower stalk, or pedicel. An important distinction in flowers is whether the ovary is inferior or superior. Flowers in which the floral parts (i.e. sepals, petals and stamens) are inserted onto the receptacle below the ovary are said to have superior ovaries. Where a flower has the receptacle fused to the sides (and often over the top) of the ovary, the ovary is inferior. Where a receptacle is fused only part way up the ovary wall, it is known as half inferior. In some plants the petals and sepals are indistinguishable - that is they are undifferentiated parts of the perianth. Flower parts that are indistinguishable as sepals and petals are referred to as tepals. Examples of this include Tulipa spp. and Lilium spp. The flower parts, especially the petals, can occur in many different shapes and colours. The petals may, for example, be partially united into tubes. The flowers of many species have symmetrically arranged perianth parts (e.g. lily), whereas others have an irregular arrangement (such as sweet pea and snapdragon). Characteristics, such as the flower shape and the number, size and arrangement of flower parts, are important for the taxonomic classification of flowering plants. Some flowers are borne singly on a stalk. It can sometimes be difficult to tell the difference between the two, especially when the individual flowers are very small. The stalk of an individual flower in an inflorescence is a pedicel. Composite head: an inflorescence composed of many small, tightly packed flowers, such as a sunflower. Other inflorescence types include corymbs, catkins, spikes and compound umbels.